Review date: 25 February 2000. If you'd told me, ten years ago, that people would pay good money for special mousemats in the year 2000... well, I would have found you more plausible than those kids' books from the 50s that firmly stated that by 1978 we'd all be commuting to work in little helicopters. But I still wouldn't have kept an eye out for hot mousemat company stock opportunities. And I would have been wrong. "Premium" mousemats still aren't all that well known, but they're selling nicely. And for good reason. 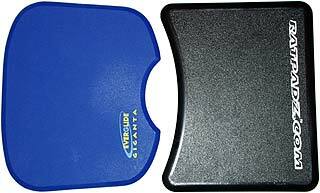 Most computer users rub their mouse on some awful piece of cloth-covered foam rubber, or one of the newer-style rubber slabs with a textured plastic top. There's one good reason to use one of these mats - they're pretty much always free, because they come with some company's logo on 'em. If you can walk through a computer show without having the opportunity to acquire half a dozen free mousemats, then your freebie-avoiding skills will be of interest to sociologists. But free mousemats are crummy. The cloth ones peel, and collect crud, which they assiduously transfer to the rollers of standard opto-mechanical mouses, via the rubber-coated ball. The newer plastic-topped ones are better, but their plastic surfaces aren't very textured - they can't be, because they've usually got an ad underneath that has to be legible. So they're often too slick, but they still transfer grot to your mouse's rollers. And they often have rather abrasive edges. If you're an occasional computer user, none of this matters. A cruddy mousemat is only a minor annoyance. Heck, you can get along without a mousemat at all - although the bare surface of most desks seems to have a preternatural ability to squirt schmutz into mouses. But if you use a mouse all day, and accuracy is really important to you - for graphics work, or for games, or just because it honks you off when your mouse rollers clog up - then a "pro" mousemat can be a remarkably good idea. Heck, it's a good idea even if you just want to clean your mouse less often. The first pro mousemat was 3M's Precise Mousing Surface, a surprisingly small vaguely kidney-shaped piece of thin, floppy, rubber-backed textured plastic. The PMS is quite a nice mousemat. Mouses get great traction on it, but the ridged surface doesn't let much dirt get on the mouse ball, or produce very much frictional resistance. And because it's so thin, the PMS doesn't jack up your hand off the desk; it's surprising how much difference the thickness of a mousemat makes. Unfortunately, the PMS is also easily gouged or folded, unless you glue it to your desk; when it was the only pro mousemat around, aficionados were used to buying a new one every few months. You can get thicker, tougher ones now, but I don't think anyone brings them into Australia; in any case, they're still, basically, floppy. 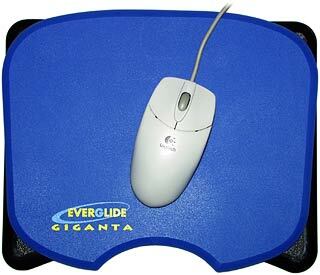 The Everglide Giganta (limited edition blue version) and a standard black Ratpad. Enter Everglide. They had the idea of making mousemats out of hard plastic. Mould the texture into the top, bevel the edge so it doesn't cut into the user's wrist, make the thing only about a quarter of an inch thick so there's not too much of a high-rise feel, stick some rubber feet on the bottom, presto. OK, so it's not going to win them a Nobel prize, but these are nifty things nonetheless. There were a few rigid mousemats around before - like these hand-made Japanese wooden ones - but they were all slick and rectangular, designed for posey executives, not hard-workin', hard-playin' serious computer users. The immediate reaction of many people, upon discovering Everglides, is that it doesn't exactly take the mind of Isaac Newton to come up with the idea of just using a cheap plastic cutting board from the kitchen. But a proper Everglide is better. The Everglide's surface texture is slick without being too slick - the plastic it's made of is different to cutting-board material, which gives less ball traction. Everglide edges are nicely bevelled. And Everglides originally came both in a cutting-board-esque oblong, and a pleasing oval with a bite out of it for your wrist, which shape is called the "Large Attack Pad". There was a slightly smaller Attack Pad, too, but that's been discontinued now. Whether there's a $5 cutting board out there that's every bit as good as an Everglide is a matter for debate. Not very interesting debate, I grant you, but debate nonetheless. Most people just bought an Everglide and were happy. Both mousemats have a rebate for your wrist, and they're much the same size. Then along came the melodiously named "Ratpadz". Hard plastic, bevelled edge, textured surface, suspiciously similar stick-on see-through rubber feet; why, it wouldn't take much of a stretch to imagine that Ratpadz were made in exactly the same factory as Everglides. The newcomer's a different shape - rectangular with an arched wrist cutout at the bottom - and it's rather larger than regular Everglide pads. But that's about where the differences end. Everglide were, and are, less than totally pleased with someone else selling what amounts to the exact same thing in a different shape. But whaddaya gonna do. They've released their own big pad, the Giganta, which they insist they've had in the pipeline for months before the Ratpadz showed up. Well, that's plausible enough; again, I don't believe an advanced degree in cogno-intellectual hydrodynamics is required to decide to make the same thing, only bigger. Both of the new big pads are about 290 by 240mm (11.5 by 9.5 inches) in size. This makes them rather bigger than most mousemats, and you may or may not actually need that much space. A plain Large Attack Pad, whose longest dimensions are about 265 by 200mm (10.5 by 8 inches), suits me fine, even when I'm using a big fat Microsoft Intellimouse Explorer (reviewed here). If you tend to row your mouse around a lot, though - which you will, if you use lower mouse speeds when playing games - then more pad real estate is handy. If you're just doing ordinary desktop mouse tasks, though, you should set your mouse speed so that you only have to move the mouse from your wrist. 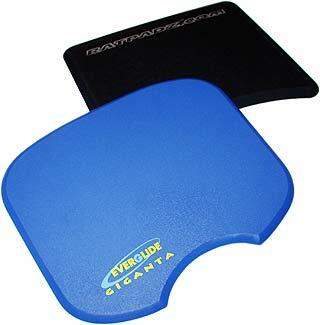 Your wrist should stay resting on your desk (or your gel-filled ergonomic wrist rest - Everglide makes these now, and one should be winging its way to me at this moment). If your mouse movements make you look as if you're playing air hockey, you need to wind your mouse sensitivity up. It doesn't work that way in games, though. There, you do not have the luxury of pausing to reposition the mouse. If your enemy keeps making you turn right, a big mousemat lets you keep doing it without lifting the mouse or having it fall off the edge of the mat. Either of these events is likely to result in someone doing unto you as you'd prefer to be doing unto him. Hence, a market for great big mousemats. The Ratpad has a slightly more pronounced surface texture, which makes it even slicker than the Everglides. If you're used to an ordinary high-friction cloth mousemat, any hard plastic mat will make your mouse feel as if it's been greased; after a brief acclimatisation period, most people seem to find the super-light action rather nice. If you want the slickest mat, the Ratpad is for you, but the difference isn't large. There's only one real problem with rigid mousemats - they wobble. 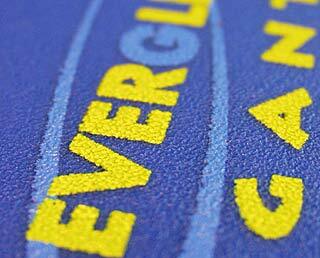 If your desk, or the mousemat, isn't very flat, then you'll have a see-saw mat. If the desk's T the culprit then a couple of little blobs of Blu-Tack are the cure; if the mat itself is bent, as these mats sometimes are, then you have to brace the thing against the edge of the desk and bear down on the sides of it to straighten it out. Apparently, with lengthy use these mats can distort slightly, because of the slightly bendy nature of the plastic. I haven't had it happen, but to fix it you just do the bend-it-back routine again. Another, minor, problem with white Everglides is that their translucent surface doesn't work with Microsoft's IntelliEye optical mouses, which have a weeny camera that looks at whatever's under the mouse. Fortunately, black Everglides are also available, and they work fine. The Giganta comes in black and a special "limited edition" blue; all of the Ratpadz so far are black. If you want to buy Ratpadz, US buyers can get them directly from the manufacturers here for $US18.95 plus shipping; non-US buyers can get them from 2CoolTek, for only $US18 plus rather more shipping. 2CoolTek also have Everglide Large Attack Pads for international customers, for only $US12.50 plus shipping; Everglide themselves sell them for at least $US16.95. Fine points of pricing are, of course, not a big deal for avid computer users accustomed to buying much more expensive objects. As computer upgrades go, a quality mousemat is about the cheapest one you'll find. Not to mention a darn good gift. Is this a lot to write about what is, after all, just a darn mousemat? Well, yes. But if you're using some scungy free mat, or nothing at all, you may be very pleasantly surprised indeed at how much easier to use a simple mousemat can make your computer. And with the new extra-large models, Everglide and Ratpadz cater for even the most highly trained cyber-combatants. Buy one of these things. You'll like it.